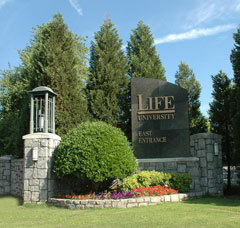 Founded in Marietta, Georgia in 1974, Life University is a health sciences institution most known for its chiropractic program, the largest in the world. Life University is regionally accredited by the Southern Association of Colleges and Schools (SACS) to award four-year undergraduate and graduate degrees in a variety of health care, science, business and general studies fields, and also has programmatic accreditation through the Council on Chiropractic Education (CCE) and the Accreditation Council for Education in Nutrition and Dietetics (ACEND). The mission of Life University is to empower students with the education, skills and values necessary for career success and life fulfillment, based on a vitalistic philosophy.